Dr. David Baer is specialized in oncology and hematology and practice medicine in Oakland, California. He graduated from University of California San Francisco School of Medicine. At UCSF Medical Center, he did his fellowship, in hematology and oncology, and follow medical studies in residency at KFH San Francisco Medical Center, in internal medicine. 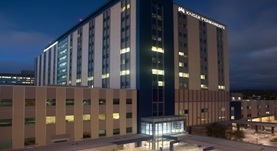 Dr. Baer is affiliated with Kaiser Permanente Oakland Medical Center and Dameron Hospital. Dr. David Baer has contributed to 3 publications. Alcohol Intake, Beverage Choice, and Cancer: A Cohort Study in a Large Kaiser Permanente Population. Klatsky, A. L.,Li, Y.,Tran, H. N.,Baer, D.,Udaltsova, N.,Armstrong, M. A.,Friedman, G. D.; Perm J. 2015 Mar 19. Efficacy of abbreviated Stanford V chemotherapy and involved-field radiotherapy in early-stage Hodgkin lymphoma: mature results of the G4 trial. Advani, R. H.,Hoppe, R. T.,Baer, D.,Mason, J.,Warnke, R.,Allen, J.,Daadi, S.,Rosenberg, S. A.,Horning, S. J.; Ann. Oncol.. 2013 Apr. Stage I-IIA Non-bulky Hodgkin's Lymphoma. Is Further Distinction Based on Prognostic Factors Useful? The Stanford Experience. Advani, R.H., Hoppe, R.T., Maeda, L.S., Baer, D.M., Mason, J., Rosenberg, S.A., Horning, S.J. ; Int J Radiat Oncol Biol Phys. 2011 Dec 1.